Thanks to advancements in technology, we are able to repair pipes without an exorbitant amount of excavation. This is possible through installing a new pipe within the damaged one, and by using existing cleanouts and access points to establish a connection to the pipe, we are able to complete the process at a faster rate. A process that continuously becomes more advanced and affordable, we are proud to offer this service to our customers in Tampa Bay. 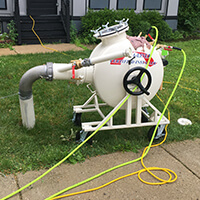 During the trenchless sewer pipe lining process, our technician inserts an inflatable line filled with epoxy resin into the damaged pipe and inflates it, allowing the resin to fully coat the diameter of the pipe, sealing away leaks or cracks. When completely cured, the resin forms a new, seamless, joint-free pipe that is just as durable as PVC, with improved water flow. The new pipe will resist corrosion, calcification, cracks, leaks, and tree root intrusions, and the material is long-lasting, preventing the need for frequent repairs in the future. As a result, this process is safe to use on a variety of pipe diameters and materials, including clay, concrete, metal, PVC, and fiberglass. The cured-in-place pipe lining technique results in a brand-new, high-quality structural pipe that is guaranteed to last for decades. Trenchless repair eliminates all the headaches and inconveniences that can result from traditional techniques. Our team at Lining and Coating Solutions can typically complete a no-dig repair project in a fraction of the time a traditional pipe repair takes, restoring full pipe functionality in a matter of hours, instead of a process that lasts days or even weeks. Because our technicians will completes the entire process from above the ground, the cured-in-place method will not disturb your landscaping, foundation, hardscaping or interior walls and floors. Trenchless sewer pipe lining repairs are also less expensive than old-fashioned plumbing techniques. In addition, trenchless sewer pipe lining minimizes our impact on the environment because it requires less gas and heavy machinery to complete the job. Contact Lining and Coating Solutions today for more information about cured-in-place pipe lining solutions for your commercial or industrial property in the Tampa Bay area. We provide trenchless sewer pipe services with minimal mess and disruption, and we take pride in the quality of our work. Let our experienced crew restore your pipes and your peace of mind – without disrupting your landscaping.